This post offers an audio example of the schisma in musical tuning. Since the schisma is such a tiny interval, it makes for a less dramatic illustration than the other commas I’ve written about. In my examples for the pythagorean comma, the greater and lesser dieses, the syntonic comma, and the diaschisma, we begin at a home note and follow a sequence of intervals that doesn’t get us back home; we arrive somewhere that’s quite audibly sharp or flat of our starting point, so much so that we can’t really accept it as the same note. In some of the examples, the pitch drifts incrementally sharper or flatter as the sequence progresses; in other examples, the pitch might drift sharp first, and then drift flat by a much greater amount, leaving us noticeably off target. The present example is somewhat different in that the upward and downward pitch drifts almost cancel out. Specifically, we start at C and traverse eight ascending pure fifths, each of which adds roughly 2 cents to our upward drift. At the end of that sequence we arrive at a G# that’s roughly 16 cents sharp of its tempered counterpart. Instead of continuing to ascend in fifths as we would if we were evoking the pythagorean comma, we cut the sequence short and skip up to B# via a pure major third. The pure major third is roughly 14 cents narrower than a tempered third, so it leaves us only 2 cents sharp of a tempered B#. (Technically, the schisma is around 1.95 cents). At the end of the example we hear this B# played above our initial C, and it sounds like a pretty decent octave, though there’s a slow and subtle beating effect. Try comparing the equal-tempered and pure versions a few times, concentrating on the G#-B# major third near the end, and the following C-B#. In the equal-tempered version you may notice that the major third sounds harsher and busier, while the C-B# that follows sounds like a pristine octave (no matter that it’s notated as an augmented seventh). In the version using pure intervals, the major third should sound more restful, but the C-B# that follows is not quite pristine. It would be quite passable in many contexts, and the subtle mistuning probably wouldn’t be noticeable at all if vibrato had been in use throughout. Nevertheless, the discrepancy is there and it’s called the schisma! Tuning: C — 1/1; G — 3/2; D — 9/8; A — 27/16; E — 81/64; B — 243/128; F# — 729/512; C# — 2187/2048; G# — 6561/4096; B# — 32805/16384. In my previous post on the Pythagorean Comma, I wanted to provide slow-moving illustrations that would give the listener enough time to judge each interval traversed. Here I’d like to provide a simpler and faster-moving example. You’ll hear a rapid sequence of ascending fifths and descending octaves, starting on C and reaching B# an octave above, which is then contrasted with the initial C. These starting and ending notes will agree in equal temperament but will differ by a pythagorean comma if the fifths throughout the sequence are tuned justly. This post is intended as a resource for exploring the foundations of just intonation. For musicians working in equal temperament it’s common to think of notes as being “built” from semitones. What is sol? It’s seven semitones above do. You might also say it’s a “perfect fifth” above do, but what’s a perfect fifth? Seven semitones. In just intonation you don’t think of notes as being composed of some small indivisible unit. The semitone is not primary. Instead, notes are derived from each other, by applying certain “special” intervals in sequence: pure perfect fifths, pure major thirds, and their reciprocals, if you’re working in the “5-limit” variety of just intonation. A note can be thought of as having intonational “relatives” with which it bears an affinity: a certain inflection of la might arise as the perfect fifth above a certain inflection of re, while another inflection of la might arise as the pure major third above fa. (These relationships are acoustically significant, because they indicate that each la is an early member of the harmonic series of its parent: our first la is the 3rd harmonic of re while our second la is the 5th harmonic of fa.) Our two la‘s both sound like a major sixth above do, and they are very close in pitch, but they have subtly different affects, as well as different lineages or derivations. The genealogy of notes in just intonation is often summarized — with remarkable concision — in lattice diagrams. Looking at the 5-limit lattice one might say that 27/16 la is three rungs right of do, while the 5/3 la is one rung left and one rung up (assuming an orientation where moving right corresponds to traversing a perfect fifth and moving up corresponds to traversing a major third). One can spend a lot of time reading materials on just intonation and studying paths in the lattice without ever hearing these paths rendered in sound. 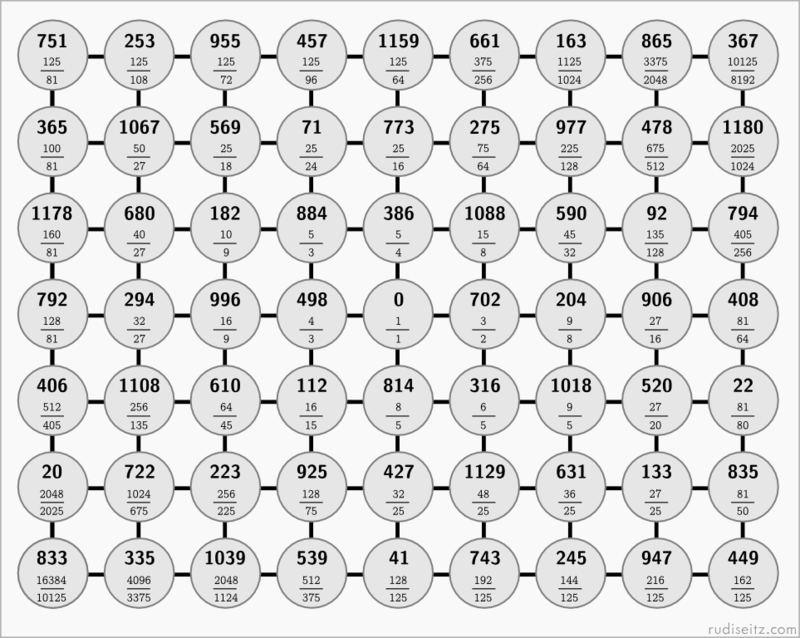 But every path in the lattice is more than a mathematical construct — it’s something you can listen to! The goal of this post is to illustrate the lattice paths for some of the significant pitches in 5-limit just intonation through short musical examples. Each example begins on a home note, C, and is designed so that you only hear pure fifths and thirds until you reach the target pitch, which is then sustained over C in the bass, and finally descends to C. Where there are multiple paths to a note, we traverse fifths first, then thirds. Notes in the sequence are held long enough so that you have time to judge the quality of each interval traversed. Each example could be thought of a kind of auditory “proof.” The claim we prove is that a certain pitch can be reached through a sequence of pure, beat-free major thirds and fifths — all the pitches in the 5-limit lattice satisfy this claim, and pitches outside the lattice don’t. If you do hear beating in the thirds or fifths it’s likely because some of the organ samples that I’ve used in creating these clips have a faint vibrato. If you’d like to hear an alternate rendering using a different instrument, just let me know. Also note that the examples assume octave equivalence: there are cases where the target pitch falls within the octave above the bass C, and other cases where the target pitch falls in an upper octave. So, where I’ve indicated an interval like 3/2, the actual interval you hear against the bass might be 6/2. In addition, there are a few cases where a chain of fifths and thirds is transposed up an octave, midway through, to keep it in a manageable range. However, octave transposition is never used in such a way that a descending fifth would be heard as an ascending fourth, or a descending third as an ascending sixth. To keep things simple from the listener’s perspective, I’ve made sure only thirds and fifths are heard until the target pitch arrives. Here are the scores and audio files for three groups of 5-limit ratios. I’ve split them into these particular groups simply to make notation easier (I wanted to avoid having multiple tunings of the same letter name in one score). Includes 2/1, 3/2, 9/8, 5/4, 15/8, 45/32, 8/5, 6/5, 4/3, 16/9, 16/15, 5/3. Includes 27/16, 135/128, 27/20, 9/5, 36/25, 25/16, 75/64. Includes 25/24, 10/9, 64/45, 32/27, 128/81, 256/135. For reference, here is a lattice diagram including all the notes in the examples (and more). The bold numbers are cents, rounded to the nearest integer; below each cent value is the corresponding ratio. Stepping right corresponds to traversing a perfect fifth (3/2) and stepping up corresponds to traversing a major third (5/4). To get your bearings when reading cents notation, simply remember that a tempered semitone is 100 cents; other tempered pitches thus fall at multiples of 100. So if you see 996 cents, for example, you know that it’s 4 cents flat of 10 tempered semitones, which is to say it’s slightly flat of a tempered minor seventh.